Advertising on KROB just makes sense. 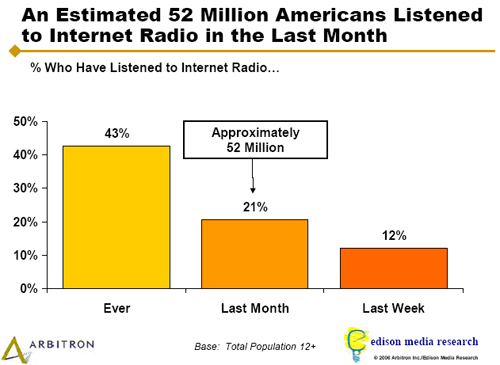 Internet radio listeners are more likely to be employed full time, more likely to make over $100,000, and more likely to have a college degree. On average, KROB listeners spend between 1-4 hours with us! Smartphones are being used more commonly as music-listening devices, details The NPD Group in new survey results. 56% of smartphone owners say they use their device for music-listening, and 65% of those report using internet radio, meaning that overall, more than 1 in 3 smartphone owners are using internet radio on their devices. About the Data: To obtain its data, an online survey was fielded to more than 2,300 consumers who are part of NPD’s online consumer panel. The results were balanced to represent U.S. adult demographics.